Salesforce CEO Marc Benioff has been under mounting pressure for the company's contract with U.S. Customs and Border Patrol. Salesforce CEO Marc Benioff is known for his support of progressive policies and liberal views on many social issues. But his company has been under pressure to dump the contract by tech workers who are critical of the Trump administration's policies on immigration. The head of RAICES, which stands for the Refugee and Immigrant Center for Education and Legal Services, said the group won't take contributions from Salesforce. The group does not want to be a part of a maneuver that aims to calm critics of Salesforce's contract with CPB. "We stand for justice and justice is not for sale," said RAICES Executive Director Jonathan Ryan. He said Salesforce is making millions from its government contact. "Our fundamental mission is to protect immigrants and refugees and to promote their rights — not be part of some kind of hand-washing operation for a corporation," he said. Salesforce has been facing mounting pressure over its contract with the CPB. 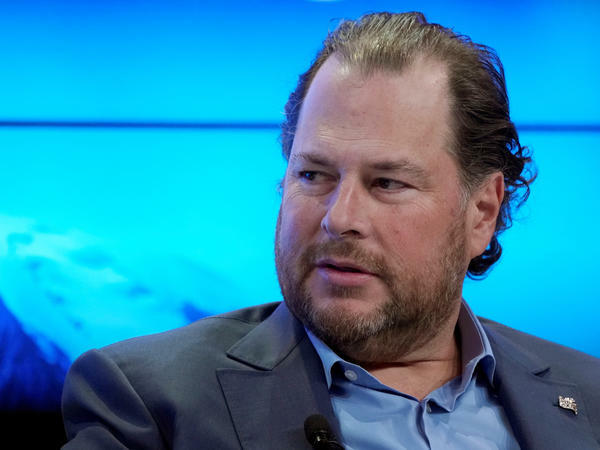 Some 650 Salesforce employees sent a petition last month to Benioff asking him to end the company's contract with the agency. Last week, community groups joined with the advocacy group Tech Workers Coalition and protested outside the Salesforce Tower in downtown San Francisco. The coalition is made up of tech employees who say they are concerned about the misuse of the technology they create. Stephanie Parker, who is with the coalition, said members of the group were excited to learn about RAICES turning down Salesforce's contribution. "It's a great feeling to have an organization that's doing such amazing work directly on the issue of family separation and border detention" to join the protest against Salesforce, she said. Benioff has said he considers the separation of families at the border wrong. When asked about RAICES' refusal of the money, a Salesforce spokesperson pointed to the same tweets Benioff sent out in response to the workers' petition. It was in those tweets that the CEO announced that the company was donating $1 million to organizations that help families at the border. The $250,000 that RAICES turned down was part of that $1 million. Benioff also said the company would match employee donations to increase the charitable giving. Benioff also defends the company by saying Salesforce doesn't work "with CBP regarding separation of families." But Ryan, the RAICES director, said Benioff is overlooking the bigger picture. "Salesforce software provides the operational backbone for the agency," Ryan said. "Thus, it does directly support CBP in implementing its inhumane and immoral policies with the software they provide." Ryan says his group would accept Salesforce's contribution if the company dropped the CBP contract. Tech companies have been facing increasing criticism about the use of powerful products. Google ended a contract with the Pentagon to make software to improve drone performance after employees protested. Amazon is facing growing criticism from its workers over its sale of facial recognition technology to law enforcement. Employees fear it can be easily be misused to abuse individual civil rights. Hundreds of Microsoft workers signed a petition calling on the company to stop working with U.S. Immigration and Customs Enforcement, or ICE. This week, a group of tech leaders pledged they would never work on artificial intelligence for autonomous weapons. Ryan said it's difficult to turn down money. "With $250,000, we could hire several attorneys for a year or more to continue our work," he said. But RAICES may have a little extra cushion this year. It was also the beneficiary of a lot support from two tech workers who set up a fundraising campaign on Facebook. Initially, the goal was $1,500. In the end, they raised more than $20 million. The timing for this fundraising is key. A lot of immigrant rights groups, including RAICES, rely on financial backing from the federal government. Ryan said he fears that the Trump administration's zero tolerance policy toward immigrants, that source of funding may soon dry up.